Heroes in Crisis #7 is definitely an issue for those who started at the beginning, with a complicated, convoluted plot and series of events beginning to knit themselves into something approaching coherency. If you’ve come to this issue first – STOP, GO BACK to issue 1. Otherwise, admire the art because it is fantastic. 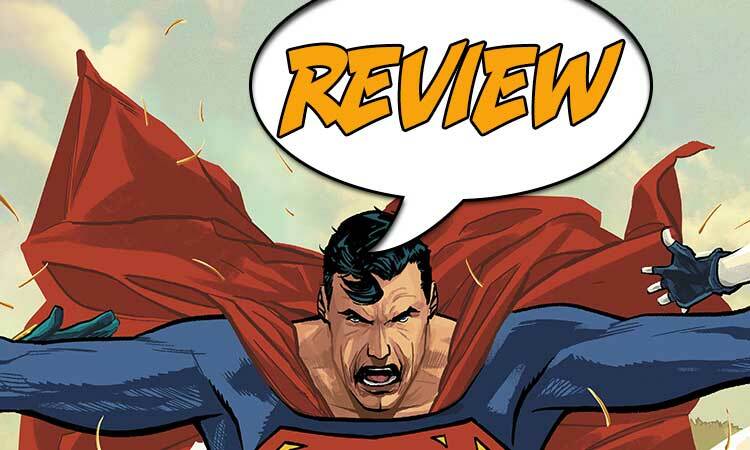 Multiple timelines, a mass killing at a superhero care facility, Harley Quinn beating the ever loving heck out of Booster Gold and two Flash’s, one Poison ivy and a partridge in a pear… your Major Spoilers review of Heroes in Crisis #7 awaits! Writer Tom King has used his own personal issues to frame a mini-series around a care facility known as the Sanctuary. Situated in the heart of America, it cares for and helps deal with the trauma superheroes experience as a consequence of the lives the lead. PTSD, survivor’s guilt, depression – of superheroes were real, then there would be some of the real world consequences they would face. Whether it’s a good idea for a comic book series is another question. No one could question King’s motives – indeed, addressing these issues in such a mainstream manner can only serve to highlight the issue to a cadre of readers who might not otherwise have sought it out. On the other hand, in a four-color world populated by characters in capes and tights, it might not be the best medium to address what is undoubtedly a serious issue. 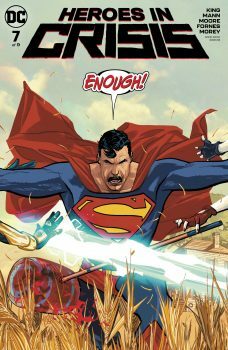 All that aside, if you have read all the previous issues, Heroes in Crisis #7, and the series overall, is a welcome antidote to the universe-shattering crossover events that have increasingly blighted the superhero comics industry since the 1990s. When I worked in a comic store during that decade, it seemed there was a crossover event every other week. My heart would sink when we received our weekly shipment from the US and it would be Zero Hour this and Zero Hour that and other events too horrifying to revisit. It assuredly kept the comic stores afloat, but it was a bubble that eventually burst and left a rather unpleasant stench about it. So it’s great to read a series that is small scope (at least so far) and looks at far more grounded issues that whether Hal Jordan should turn the universe’s lights out (or whatever he did – answers on a postcard, please). Away from the Harley Quinn’s beat down on Booster Gold, and Batgirl’s amusing action to turn of Booster’s shield, we have the Flash, in three different strands – in a field of flowers, spilling his guts in a recorded therapy session, and speeding around the world helping Batman search for clues, providing the ballast to the story. Certainly, the most affecting aspect of Heroes in Crisis #7, which reminds the viewers of the intent of Sanctuary, is Flash’s address to camera over three separate weeks, and the desperately sad final page where he breaks down at last. The mystery continues to unravel, but the emotion at the core of the story is where its true heart lies. 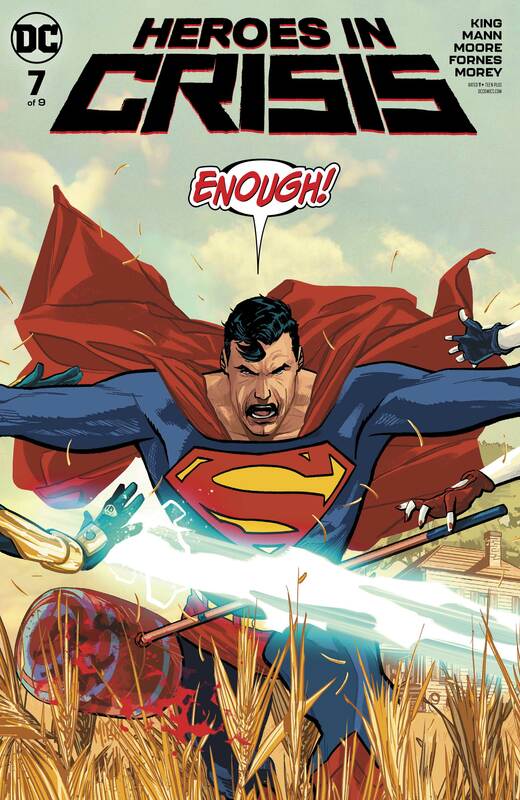 Heroes in Crisis #7 uses three different artists – I imagine this is an artistic choice, and not simply two extra illustrators coming on board at short notice to help out. First time reading the issue, I didn’t realise there was a triumvirate of artists on board, mainly because of the vibrancy of Tomeu Morey’s utterly beautiful coloring. This is especially so in his vivid field of flowers scenes, where Flash births Poison Ivy from a rose he has planted – the lushness of the colors brings immediacy in particular to these pages, but also to the rest of the issue. Each of the artists brings their own subtleties to the issue, with Clay Mann’s art most truly in the superhero mode. I enjoyed Jorge Fornes’ Batman, with a nod to the Year One look, but overall, the art was spectacular.